This packing is manufactured from the purest graphite filament yarns – NO PTFE or lubricants are added – only graphite dispersion. Designed for critical valve applications, G-700 has been tested by independent laboratories and has successfully met the difficult specifications required by the power generation industry. G-700 has a very low coefficient of friction and is totally nonabrasive in valve applications. Ideal for critical valve applications (used as end rings ONLY) in nuclear and power generation industries. Tested by independent laboratories; compliant with:- MIL-P-24583B (SH)- General Electric Spec. D50YP12 Rev. 2 dated 10/92. 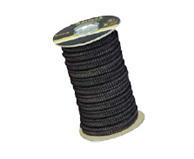 Excellent used as end rings (anti-extrusion) in combination sets with GRAPH-LOCK® material. Contains no PTFE or other lubricants Totally non-abrasive; very low coefficient of friction.